Everything you need to know about Budget car rental in Canada. The Car Rental company Budget was founded by Morris Mirkin in 1958 in Los Angeles, California, USA and it is now celebrating 50 years of providing great value car rentals. It strives to be a Rental Car Company for the "budget-minded" renter. Budget continued to stay true to its name, providing renters with the same value for money, quality service. Here at VroomVroomVroom we can find the right car at the right price just for you! 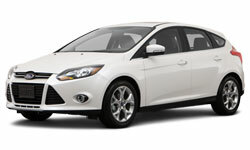 Check out the Budget Car Rental deals and specials throughout Canada.